The Chroma-Q® Color Force 12™ is a truly multi-purpose LED fixture that is suitable for numerous entertainment lighting disciplines. The unit provides power across the spectrum, from deep cold blues to red hot lava looks all from a single fixture. At only 335mm / 1ft* long, the unit is ideal for floor, wall or truss mounting. It also provides a massive output of 2,400 lumens, easily washing up to 8m / 26ft with smooth, theatrical grade dimming. The Color Force 12™ is suitable for numerous entertainment lighting disciplines, including uplighting, pipe-end, shin-busting, backlighting and wash applications. Producing 2,400 lumens output, the CF12 can also be used to extend Color Force 48 and 72 LED batten installations. The mighty power output ensures seamless wall washing up to 8m / 26ft. Opposite demonstrates the Color Force output compared to a traditional 1kW cyc flood. Identical camera setting were used in the comparative photos. The Color Force 12™ uses its huge RGBA colour mixing palette to deliver a full range of high brightness colours across the spectrum. Deep cold blues and red hot lava looks are all available from a single Color Force fixture. The Color Force custom optical design provides a smooth, uniform output with outstanding colour blend across the spectrum. In everyday use the Color Force 12™ is roughly comparable in output and cost to a 750W PAR with colour changer and dimmer channel. With a 50,000 hour L70 lamp life and over 80% power saving when compared to a 750W PAR (even more at saturate colours), the ongoing financial savings of the Color Force 12™ are huge. It is anticipated the unit will actually pay for itself within 13,500 hours of use*. 13,500 hr x 630W = 8505 kWh. Compatibility with industry standard control consoles is assured. 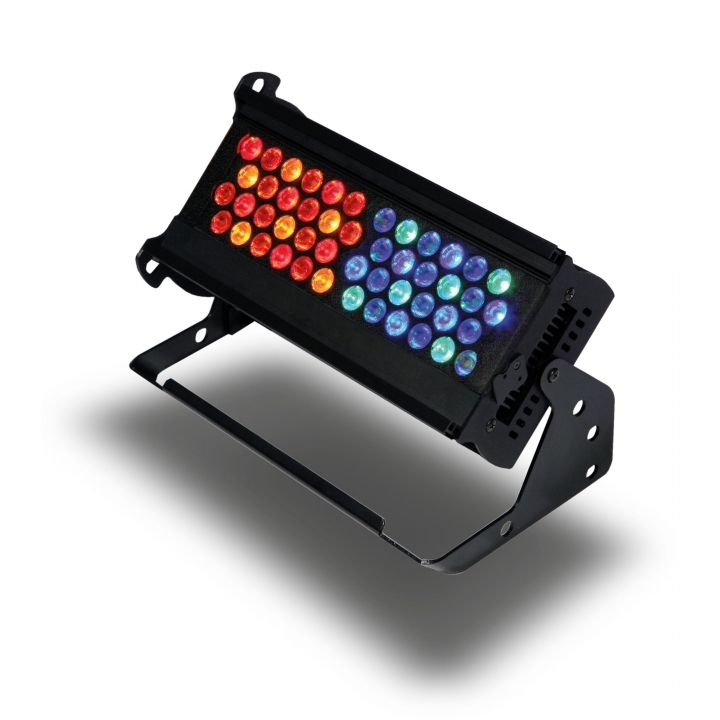 HSI, RGB, RGBA, RGBI and StRGBA DMX modes are all included.